Posted on October 3, 2018 October 3, 2018 Bizarre.Los.AngelesPosted in Haunted L.A. The Chateau Laurier was built in 1929 at an original budgeted cost of $260,000. Its architect was Leland A. Bryant. The building has 24-units and a parking garage. It also boasts two wooden elevators with oil paintings inside each one. Recently, it hit the market for $12 million. 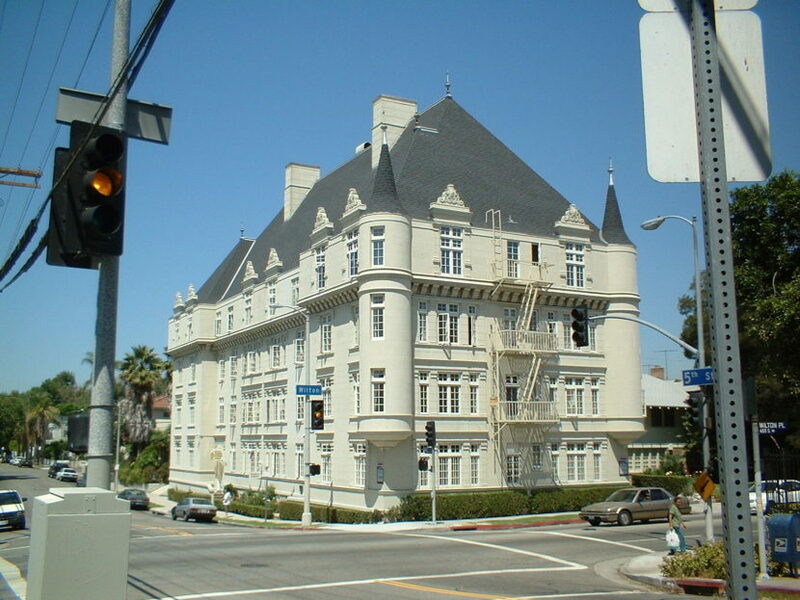 Driving down S. Wilton Pl., the French-inspired Chateau Laurier sits on the northwest corner of Wilton Pl. and Fifth St. The four-story building was erected in 1929 and designed by Leland Bryant, an architect known for implementing arches and turrets in his designs all over Los Angeles. The Chateau became the pride of the “Ritz” management company, appearing on many of their brochures before they sold it and the neighboring cottage to Seymour, LLC in 2008 for $4.3 million. On our tour of the building, we were struck by its high ceilings and glamorous atmosphere. More than anything, however, it was its rich history of illustrious and eccentric tenants that impressed me. During our interview with the 30+-year-resident manager, Wendel Peterson and his wife Marilyn (author of “Vegan, Bite-by-Bite”), I learned a great deal about the building’s rich history as I sipped on the cantaloupe smoothie prepared by Marilyn. There was Ingrid Cassares (girlfriend to Madonna) and Deanna Durban (child star who sang and danced in the 30s and 40s), as well as a man who had a hobby of marching the halls with a vintage rifle over one shoulder, guarding against foreign incursion. We took a tour of the 19-unit Chateau starting in the original wood-paneled elevator with a manual sliding door, and then descended to Peterson’s carpentry workshop. Peterson has repaired much of the historical building’s woodwork himself. Peterson made a startling addition to his own apartment: He installed arches into a blank wall and had a painter fill the space between. He had created the impression of looking out over a forested mountaintop vista. Next, we visited the Chateau’s nine-car garage featuring a unique method of parking designed to accommodate older (and much lengthier) cars. To park in the Chateau garage, one has to enter a very narrow alleyway alongside the building. At the end of this alley is a mechanical turntable that once assisted the drivers in making a sharp turn, otherwise impossible, thanks to their long rectangular vehicles. Peterson explained, by means of anecdote, that security for the building was very good. One time, a singularly inept car thief had his eye on a Mercedes roadster he had seen in the garage. After shimmying the front door, the garage access door, and that of the car, he was driving it out of the lot—only to have the front gate slam down on the hood. Panicking, he then proceeded to wake the entire building with a series of crashes as he attempted to ram the front gate. This was the only remotely successful attempt at thievery in the 31 years of Peterson’s time as building manager. Most of his tenants have lived there longer than 15 years, (the longest having stayed for 43 years) indicating a high degree of satisfaction, both with the building itself and its management. Chateau Laurier is a well-maintained treasure, and with its customized woodwork, crown molding on its ceilings, and original chandeliers, it has lost none of the charm that once caught the eye of LA’s elite. In April of 1945, 20-year-old resident of the apartment building, Wilbur A. Hudson, was gunned down by police on the 5700 block of Hollywood Boulevard, while trying to escape on foot from a car he had stolen. Hudson, who had recently been discharged from the Navy, was already on probation for an earlier car theft conviction. However, according to a tenant that used to live in the building, the resident ghost isn’t Hudson. It is a woman. She told me her story during an interview for a HAUNTED BY HISTORY photo shoot. The woman, dressed in impeccable mid-century attire, turned to look at her, but remained silent. After receiving no reply, the tenant told the woman she had to leave. The woman silently rose to her feet. This frightened the tenant, who rushed back into her bedroom to grab a cell phone to call the police. When the tenant returned to the den, the woman was gone. The chain lock was still fastened on the inside of the door. The tenant, obviously shaken, called the management to tell him what just happened. Apparently, either the manager or a couple of longtime residents who later heard the story believed that the ghost woman’s description matched that of a former tenant who had died years earlier from a heart attack inside the unit. But that isn’t the only report of paranormal activity inside the building. Others have claimed to have felt cold spots or had personal objects misplaced in their units. If anyone has any stories to add, please feel free. When I asked the former tenant which apartment unit this ghostly encounter happened in, the storyteller wouldn’t say. I got the impression, however, that it might have been on the bottom floor near the laundry room.